Yesterday was a sublimely beautiful day. At last we are having a spell of proper winter weather, with nightly powderings of snow and freezing blue-sky days. Every morning is a thing of wonder at present, but yesterday was exceptional. 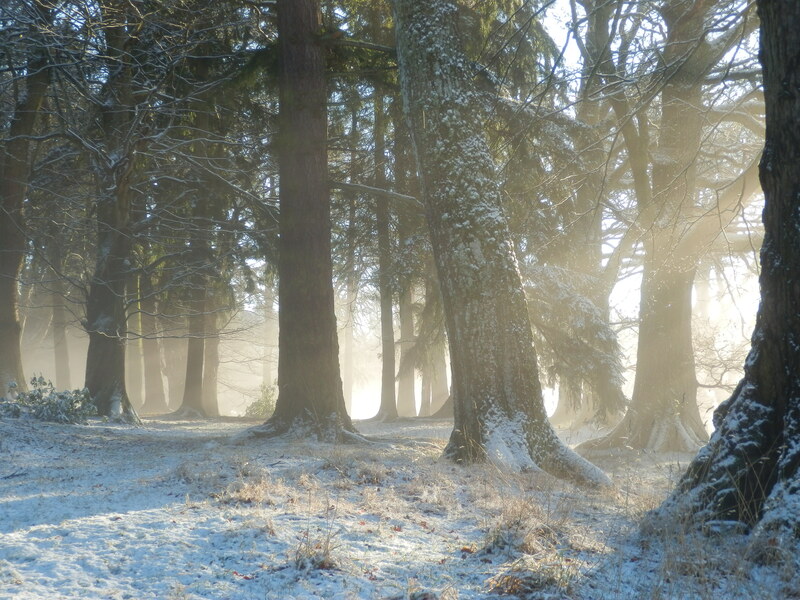 By midday, the sun had warmed the air just enough to make the snowy fields steam gently, so that a layer of pearlescent mist lay over the landscape, bathing the tree roots and turning the sunshine into a hazy golden radiance. Turning off an indigo-shaded path into the sun in my favourite woods, late in the morning, I found myself welcomed into transcendent light. I hope that heaven has a corner like this. 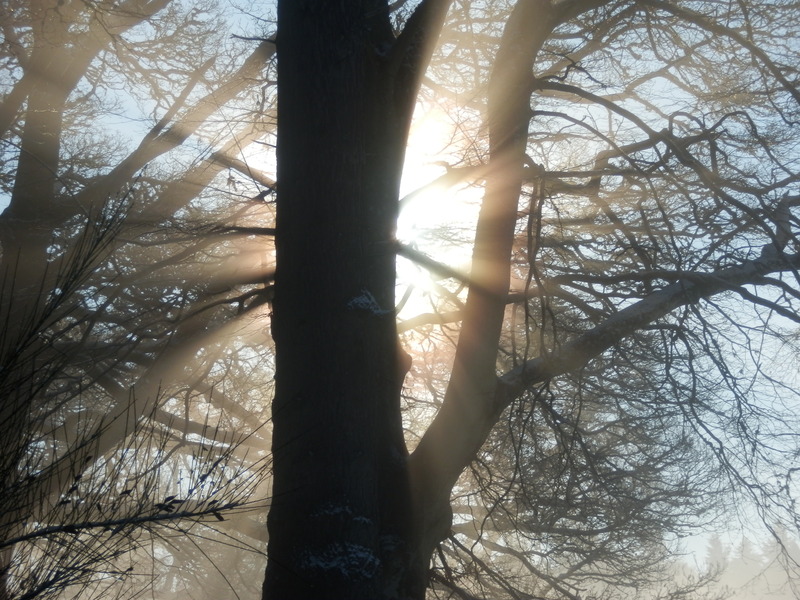 Last January was wet and windy, but there were still wonderful effects of the light to be found: see Woodsmoke and sunshine. 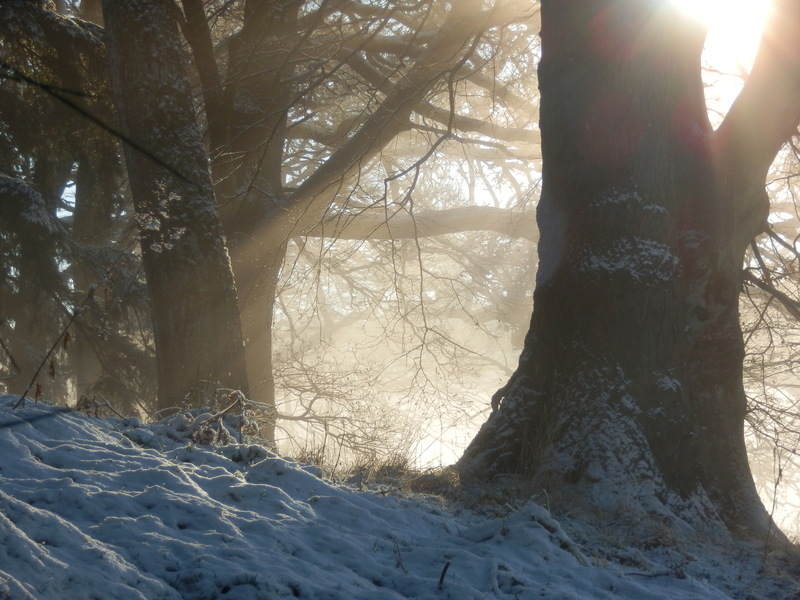 You might recognise some of these trees from their November conversation. Sublime, DB! Such beauty seems otherworldly and you have captured it wonderfully. It was gorgeous here too yesterday, but sadly I was out all day and couldn’t take any photos. I am very lucky to have time to ‘stop and stare’ on days like this. Beautiful. 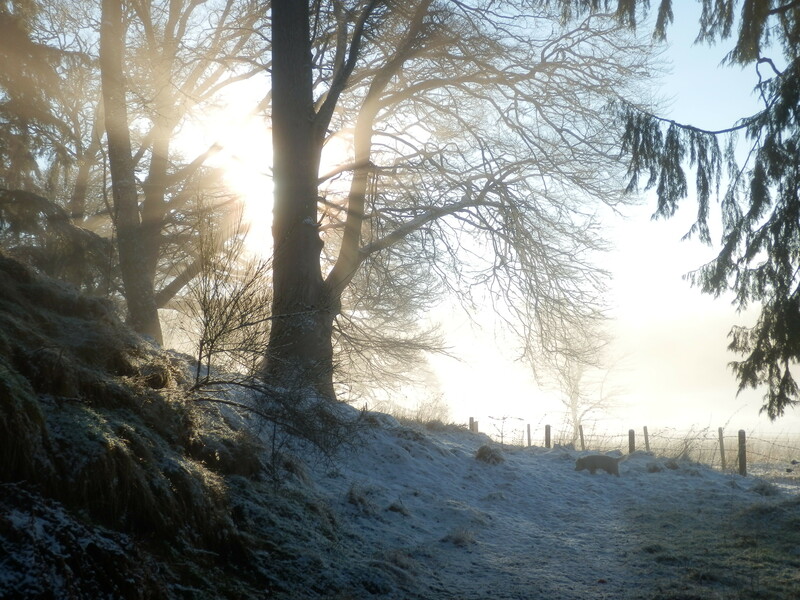 It’s very cold and grey here, but the frost has clung to the branches all day, like a good shake of icing sugar. I just love frosted branches. May have to do a post on them in fact! “pearlescent mist” and “indigo-shaded path”. Best description of this type of scene ever! Well done. Aww, thanks – and hope you got that sunshine! Very atmospheric. Winter can have it’s own charm. Beautifully described, and the photos are just superb. I, too, hope that heaven has a shady woodland like that one! I love (and envy) your way with words. Beautiful post and stunning pictures. Thanks for sharing them – trees AND snow what a gorgeous combination 🙂 No snow here, just wind so far…. I wish I were like you and enjoyed the cold, DB, but at least I can come here and enjoy your photos and experiences (in the warmth).